California was the first state in the country to pass a paid family leave law. New Jersey has had partial paid leave since 2009 and Rhode Island since 2014. New York's paid leave laws went into effect this year and the District of Columbia and Washington state's programs are scheduled to start in 2020. Twenty-one other states have proposed similar legislation. Even without state mandates, some employers provide paid time off for parenting and care giving, but most do not. Generally, employees receive partial pay from an insurance policy they pay into. Sometimes, the employer pays, too. Paid leave is becoming a popular benefit as employers look for ways to retain and attract talented employees and build a supportive company culture. And with more families needing two incomes and single-parent families on the rise, many families can't afford to make do for very long without a paycheck. Up to 26 weeks leave is available in a single 12-month period for employees who need to care for a service member who has a qualifying serious injury or illness. 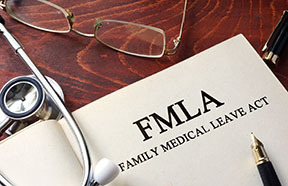 FMLA also requires employers to restore the employee to the same or equivalent job and to maintain the employees' health benefits. Some states offer more generous FMLA coverage — such as requiring smaller employers to offer coverage — so it pays to check your state's laws. For an example of what regulations might look like if similar paid leave programs are implemented in your state, take a look at what New York did at the beginning of this year. The New York Paid Family Leave (PFL) is one of the most comprehensive family leave programs in the nation. The program requires employers to provide their employees with job-protected time off to bond or care for a new child (birth, adoption, foster), to care for a family member with a serious health condition, or to handle qualifying military exigencies for a family member. PFL benefits provide insurance coverage and are funded through employee payroll deductions. All PFML laws have caps based on income, and some laws cap the weekly benefits at $1,000 per week. The rules are different for employers who self-insure. The maximum weekly employee contribution for coverage is 0.126% of an employee's weekly wage. Based on an average wage, the employee would pay $1.65 per week. The number of weeks of paid leave varies according to the state and situation. For example, Washington, D.C., awards paid time off based on the situation, while Rhode Island provides for 4 weeks leave and California and New Jersey provide for 6 weeks. New York plans to increase its paid time off to a maximum of 12 weeks by 2021. For more information on the FMLA and other compliance matters, please contact us.